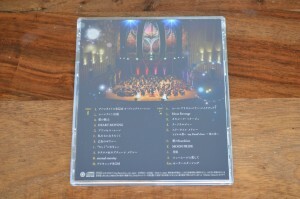 The Pretty Guardian Sailor Moon Classic Concert CD was released in Japan on December 6th. This sells for 3500 yen which is about $31 US. Media in Japan is usually more expensive than in North America so this price is actually pretty reasonable. 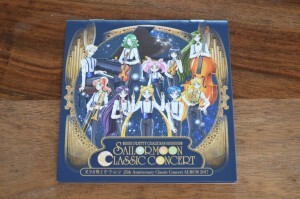 This CD includes the entire performance of the Sailor Moon Classic Concert which was performed by the Tokyo Philharmonic Orchestra in Japan this past August. Now that I’ve given the CD a few listens I felt like sharing some thoughts on it. 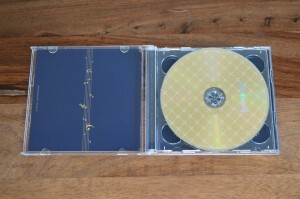 You can pick up the CD from Japanese retailers such as Amazon Japan and CD Japan. All around the album is great. It’s a real mixed back of very classical sounding renditions while others have a more modern feel. It’s not simply the case that all songs are performed in the same style as we’ve seen with the Sailor Moon SuperS Orgel Fantasia album which makes everything sound like it’s played by a music box. The selection of music is also quite varied. While it is mostly renditions of popular opening and ending themes from the original Sailor Moon anime there is also a bit of background music as well as music from musicals and Sailor Moon Crystal. Sadly nothing from the live action Pretty Guardian Sailor Moon series has made the cut! The CD comes with your standard sort of insert booklet that’s only a handful of pages. 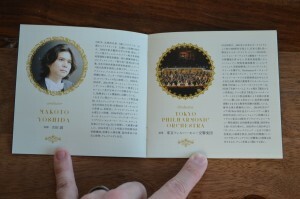 It includes a full track listing and information on the many people who worked on the music and this concert in particular. I’ll give a few thoughts on each of the tracks. This won’t be anything thorough! I’m not really a music buff and I know even less about actual concert music. I took the trumpet in school for 3 years pretty much because it was part of the curriculum and after the end of the 3rd when some of my classmates who had started that same year had surpassed me in skill it was evident that it wasn’t happening for me so I concentrated on drawing and messing around with computers. One of those paid off. 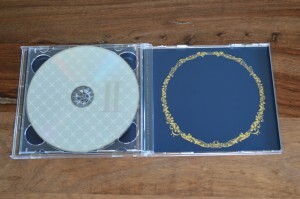 The set comes in two discs with a total of 21 tracks. Disc 1 track 1 is background music from the introduction to episodes. Track 2 is Moonlight Densetsu (Moonlight Legend), the iconic Sailor Moon opening theme! This has been done in a variety of styles over the years and here is yet another! A fairly faithful adaptation. Track 3 is Ai No Senshi (Guardian of Love), a song which was featured in Sailor Moon R and Sailor Moon S and that has been redone a few times. This is one of my favourite songs from Sailor Moon and it’s very well done on this CD. It has an epic quality that fits it quite well. Track 4 is Heart Moving, the first ending theme for the first season. This is a decent instrumental version of the song but not the greatest. While I don’t have any strong feeling about this song as an ending theme there are a number of instrumental versions which feature in important and emotional scenes in the first season including when Sailor Moon is discouraged after the death of her friends and finds the motivation to continue fighting. This version doesn’t evoke the same emotional reaction in me than that particular version does. Track 5 is Princess Moon, the second ending theme for the first season. This track reminds me of something out of ballet which I think suits it. It starts to show the range that this concert can offer. Track 6 is Watashi-tachi ni Naritakute (Wanting to Be Together With You) which is the first ending theme for Sailor Moon SuperS. Why do we jump ahead so far instead of staying somewhat chronological? No clue. This is similar to the TV version and is a good track. Track 7 is Otome No Policy (Maiden’s Policy) which is the Sailor Moon R ending theme. This is a punched up version which isn’t really classic as many of the tracks leading up to this have been. It includes vocals by Yoko Ishida who originally performed the song back in the 90s. I prefer the version on the 20th Anniversary Memorial Tribute Album personally. 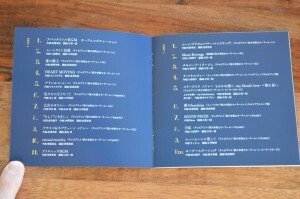 Track 8 is “Rashiku” Ikimasho (I’ll go with my looks) which is the second ending theme for the Sailor Moon SuperS season. It has a sort of big bang feel and includes vocals once again from Yoko Ishida though she did not perform this song in the original anime. Track 9 is background music for Sailor Uranus and Neptune. This is a variety of music used in the anime mostly when the characters are introduced or transform. It features a lot of violin as the music in the original Sailor Moon anime did, with Michiru being a violinist. This is quite a good track for fans of those characters! They always did have great theme music. Track 10 switches gears and gives us a song from Sailor Moon Crystal. Eternal Eternity is the first ending theme for the 3rd season, which is also all about Sailor Uranus and Neptune. All versions of this song just remind me of the Utena opening theme. Track 11 is short and just gives us the music for the commercial break bumper for the first season. It sounds so much like the original version that I was expecting the weird “chirp” sound which can be heard on the laserdiscs of the first season. Track 1 has Kotono Mitsuishi, the voice of Sailor Moon, speaking over some background music and then transforming to Sailor Moon’s first season transformation music. A fairly faithful version of this music. Track 2 is Moon Revenge, the theme song from Sailor Moon R The Movie. This is one of the better songs from the original anime. This version is great as well. It’s a more classical rendition lacking the more upbeat tone of the original song but it works quite well. Some portions remind me of the instrumental version featured in the film. Track 3 is Tuxedo Mirage, the ending theme for Sailor Moon S. The version here is very similar to what we heard on TV, without the vocals. A good track but it just doesn’t give us anything new. Track 4 is La Soldier which is a song which was used in a number of the early Sailor Moon musicals as well as the final episode of Sailor Moon R (Let’s pretend episode 89 doesn’t exist because I hate it!). This is a good rendition but not as good as the original and nothing could top the Tommy heavenly6 version from the Tribute Album for me. Track 5 is a Three Light Medley which merges two songs which the Three Lights performed during Sailor Moon Sailor Stars, Todokanu Omoi -My Friend’s Love- (Unreachable Feelings: My Friend’s Love) and Nagareboshi he (To the Shooting Stars). When this one started I was a bit worried because the Three Lights are a pop group and their music doesn’t translate to classical music. Still the orchestra manages to give these songs a disco kind of 70s pop sound which I think works really well. The track lacks vocals I think because the concert hall didn’t have enough place to include Taiki’s forehead. Track 6 takes a song from the recent Sailor Moon musicals with Ai No Starshine (Starshine of Love) from the Sailor Moon Amour Eternal Musical. Again we go with a somewhat modern sound almost fitting to an 80s TV drama theme song if that makes any sense. I appreciate the unique take on the song and that an orchestra can have such an atypical sound. Track 7 is Moon Pride, the first Sailor Moon Crystal opening theme. It’s performed with a big band sort of sound. Enjoyable. Track 8 is Gekkou (Moonbow), the first Sailor Moon Crystal ending theme. Again this track is quite similar to the original version which had a very orchestral sound. Decent but nothing new here. Track 9 is New Moon ni Koishite (In Love With the New Moon), the Sailor Moon Crystal Season 3 opening theme. It has what I believe is a lot of saxophone and other brass instruments. A fun track. The final track is an encore which is the Sailor Stars Song, the opening theme for the Sailor Stars season of the original anime. Yoko Ishida performs the vocals for this version, though again she was not the one to contribute the original vocals. She does a decent job. She attempt to rouse the crowd and get them to sing along which doesn’t seem to work all that well. I’m not sure if this is because the crowd isn’t participating much or simply because they didn’t bother to put a mic in the crowd to properly pick up the audio. I don’t know how popular the Sailor Stars Song is in Japan but I wonder if this was really the best track to try to get people to sing along to. If they’d done this with Moonlight Densetsu, the iconic opening theme used for the first four seasons, no doubt a ton of people would know the words. Does the average Japanese casual fan know the words to the intro of the final season which had significantly poorer ratings? All considered I quite enjoyed this CD and recommend fans import it if they’re interested. Keep reading for more pictures of this CD including photos of all remaining pages of the booklet. A CD collecting music from the Sailor Moon 25th Anniversary Classic Concert is coming December 6th! 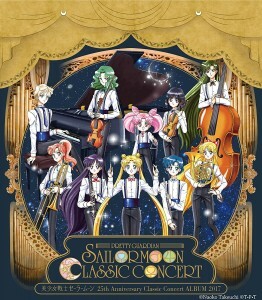 This concert, where the Tokyo Philharmonic Orchestra performed songs from various Sailor Moon series, took place in Japan on August 2nd and 3rd at the Tokyo Metropolitan Theatre. This album will be released in Japan but is available to order online from sites such as Amazon Japan and CD Japan. The price is 3500 yen which is about $33 US. The album collects mostly opening and ending themes from all five seasons of the original Sailor Moon anime, a couple of songs from the musicals, a few songs from Sailor Moon Crystal and a bit of instrumental background music. Some songs are instrumental while others include vocals. 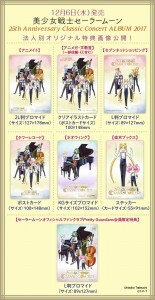 A track listing is available on the Official Sailor Moon site. I’ve translated it and included it, and a description of where the songs are from, below for your convenience. In order to promote this release a four minute video of the concert has been released. You can watch it embedded below. I look forward to sharing my thoughts on this album once it’s released. Fans in Japan can get special exclusive incentives from various retailers. Amazon Japan and CD Japan are not included. One of the incentives is from the Official Sailor Moon Fan Club however this item does not appear to be available from the international Sailor Moon Fan Club.